Some people think the concrete mixer can mix the mortar, but some persons think the mortar can not be mixed by the concrete mixer. So concrete mixer can mix mortar? Zhengzhou CamelWay Machinery will give you the answer. 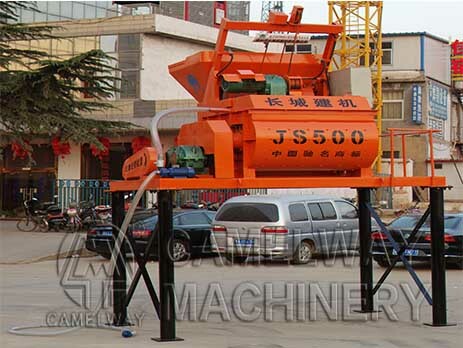 Concrete mixer is used for mixing the mixture material consisted of aggregate and water, and cement. Because contain coarse aggregate, and therefore require huge stirring power. So the stirring blades and liner of the concrete mixer is made from high chromium iron, so its power is larger. JS500 need 18.5 kw motor to drive. Mortar does not contain coarse aggregate, and thus power is small, power consumption is low, do not need to wear parts. Concrete mixer cannot be replaced by mortar mixer in general specification, however, concrete mixer can be used to mix mortar. Some special engineering requirement for mortar is higher, must must mortar mixer to mix mortar. Above is a brief introduction, if you want to know more information, you can contact us.